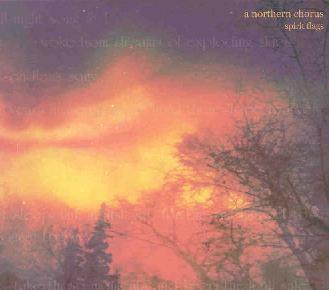 A Northern Chorus - "Spirit Flags"
Rather than having faded away in the mid-nineties as some critics have suggested, the shoegaze sound is still alive and well, and continues to evolve with a new generation of artists that include among them Hamilton, Ontario’s A Northern Chorus. On their debut album, the evocatively named Spirit Flags, the band combines deep, reverberating layers of acoustic and electric guitars, dreamy vocals, drifting melodies, and hazy sonic sheets of sound, sometimes in a slow spacey environment like the haunting, dirge-like and dynamic Let the Parrots Speak For Themselves; and other times in a upbeat, more heavily driving setting like the excellent melodic, instrumental track Red Carpet Blues. By and large, though, A Northern Chorus focuses, more than their shoegaze forerunners, on beautiful melodies along with the textures (and far less "noise"). The inclusion of viola, violin, and flute gives some of the pieces, like the simple and wistful Fragile Day, a bit of chamber music feel too, like the pop music equivalent of fellow Canadians Godspeed You Black Emperor!. Whilst not a groundbreaking album, Spirit Flags is an undeniably pleasant and satisfying journey for fans of bands like Low, Slowdive, or Belle and Sebastion. For more information you can visit the A Northern Chorus web site at: http://www.anorthernchorus.com. Spirit Flags is distributed by Sonic Unyon. You can visit their web site at: http://www.sonicunyon.com. Contact via snail mail c/o Sonic Unyon Recording Company; PO Box 57347; Jackson Station; Hamilton, Ontario; L8P 4X2; Canada.